The Tenth Judicial District Commission on Judicial Performance voted 9-0 with one member absent to recommend that Judge Jill S. Mattoon BE RETAINED. Judge Mattoon was appointed to the District Court in 2006. 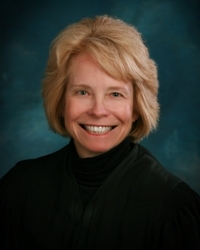 Prior to her appointment, Judge Mattoon served as an Administrative Law Judge with the Colorado Office of Administrative Courts. Previous to that appointment, Judge Mattoon was an attorney in the District Attorney’s Office in Pueblo, Colorado and then entered private practice. She received her undergraduate degree from the University of Colorado and a J.D. from the California Western School of Law in San Diego, California. The Commission conducted a personal interview with Judge Mattoon, interviewed agencies that interact with her in court, reviewed orders and opinions she authored, observed her in court and reviewed surveys sent to attorneys and non-attorneys. Among the survey questions was “how strongly do you recommend that Judge Mattoon be retained in office or not be retained in office?” Thirty-two attorneys and thirty-two non-attorneys completed a survey for Judge Mattoon. Of attorneys completing the survey 72% recommended to retain, 22% not to retain, and 6% made no recommendation regarding retention. Of non-attorneys completing the survey, 48% recommended to retain, 36% recommended not to retain and 16% made no recommendation regarding retention. Judge Mattoon has presided over criminal matters and currently presides over civil, probate and domestic relations. Based on survey results among attorneys, Judge Mattoon has strong administrative skills and receives high marks in case management. She receives high marks for promptly issuing orders. However the survey results also suggest that she lacks knowledge of the law. Judge Mattoon is aware of these perceptions and reports that she pursues as many opportunities as possible to receive further training and education. The Commission believes she is making progress and continues to make progress in this area. Judge Mattoon enjoys being in the courtroom and attorneys appearing before her report that she is engaged in the courtroom. Judge Mattoon has taken to heart past criticism of her performance and has worked hard to improve.